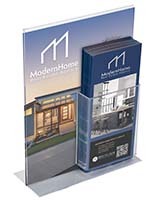 This molded plastic sign display has a front pocket for your flyers and brochures. 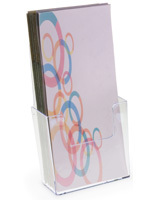 This signage frame, like many inexpensive picture holders, is used to advertise both signs and leaflets. 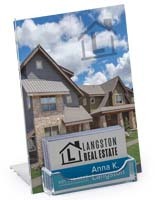 This plastic sign display with pockets is popular in high traffic environments and for large scale promotional rollouts. 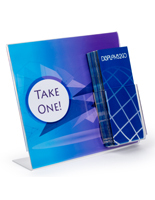 Each frame has a convenient top loading slot for easy insertion of your graphics. Simply slide an 8.5"w x 11"h advertisement from your printer into and out of the frame using the convenient thumb notch. 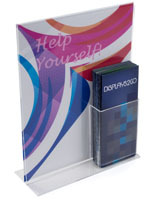 This plastic sign display is a cheaper version of our upscale, deluxe line of acrylic frame. This cheap molded frame has been injection molded versus hand fabricated; the material used is a cheaper polystyrene and not optically clear acrylic. 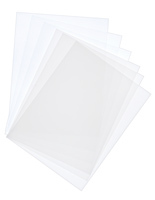 This plastic sign display has a slightly blue-ish tint to it and is thinner gauge (thickness) than our deluxe line. Although not equivalent to the deluxe line it is still a very functional unit for advertising graphic prints and dispensing literature. 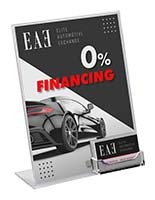 This plastic sign display, also known as a cheap frame with a pocket, features a frame enclosed on 3 sides to prevent curling of your printed image. Graphic changes are made from the top open slot at any time. We recommend shoppers purchase this plastic sign display for price point reasons only, not recommended for upscale environments such as banks and museums. Buy this combination frame to offer customers take home reading material along with an entice signage to catch the attention of visitors. Each plastic sign display is manufactured with the literature pocket permanently affixed to the bottom right corner of the frame. For similar units in different sizes and designs please be sure to check out the related product suggestions. This plastic sign display is a great buy for any shopper working with limited budget. 8.8" x 16.0" x 3.4"
4.1" x 4.4" x 0.75"
Received quickly and works great. Thanks, Displays 2 Go! You're very welcome, Lorrie! We're glad that this sign holder is working great for you. Thanks for the great review! This product is high quality and functions just as we wanted. Ordering and shipping were great. Ryan, thank you so much for the great review! We take pride in the quality of our products, and we're so happy that our acrylic sign holder was perfect for your needs. Please let us know if there's anything else we can do to improve your experience — we always appreciate our customers' feedback. I ordered this product to use at job fairs. I was looking for something cheap and simple, and this definitely meets those needs. However, it did arrive with the bottom portion heavily cracked. Thankfully when the materials are in their slots it hides the fact that its broken, but it was disappointing for it to arrive this way and I'm afraid that it will continue to crack before we even get to use it. Would probably order again though for the price point. Courtney, we're sorry to hear that your product arrived damaged. We can definitely help you get a replacement! No need to settle for a cracked unit! A customer care specialist will be reaching out soon to assist. Thank you for your kind words despite your troubles and we appreciate you letting us know. We are so pleased with these sign holders. I had been looking for a stand-up sign of this size with a brochure rack holder and was surprised it was so hard to find. I had given up finding it in the catalogue that gets passed around the office, and did a quick search and found Displasy2Go. The buying experience was seamless and delivery of the items went perfectly. We are very happy with the quality of the product and would definitely recommend using Displays2Go to others. We are so happy to hear about your awesome experience with us, Courtney! Thanks for the review. 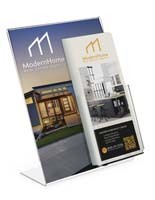 Your signage and marketing materials look amazing! 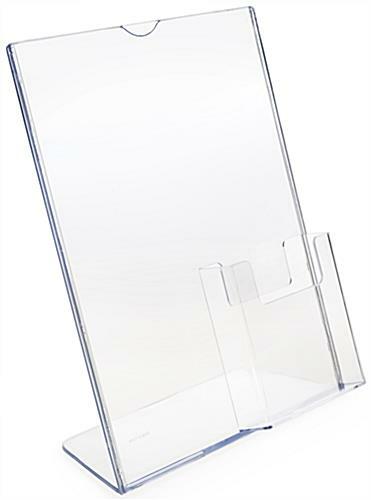 These acrylic sign holders with pocket are adequate, and the price is good, but extra care needs to be taken when transporting them as the acrylic is thin and breaks easily. 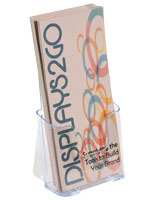 Displays2Go does a great job of packaging them securely to protect them in shipping. Thanks, Nancy. We rely heavily on feedback like this as it helps us to constantly improve the quality of our products. Thank you so much for taking the time to review! We'll pass along your experience to our product developers.